Quest on King William in Adelaide has spent $3 million on a major top-to-toe renovation. 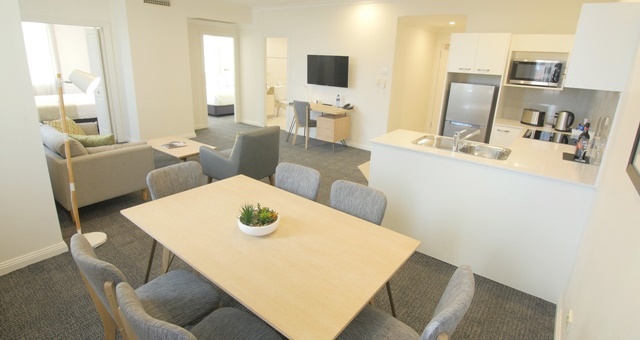 The fruits of a $3 million renovation covering 72 apartments at Adelaide’s Quest on King William self-contained apartment have been revealed exclusively to HM. Due for completion in December, the project has seen a top-to-toe upgrade to every apartment, which already benefits from the original conversion not crowding the area with too many rooms and apartments. In addition to new paint, designers have been tasked with providing a “home away from home” feel while not diluting the heritage feel of the building itself. Among the successes has been in the new furnishings and decorations added to the room including the bed runners, scatter cushions and a coppery colour in the legs on the timber book cases. According to a hotel spokesperson, the property has some of the largest apartments in Adelaide, with its smallest studio beginning at 36 square metres and three-bedroom apartments measuring nearly 100sqm. The first skyscraper built in Adelaide, the edifice on the corner of King William and Grenfell Streets in Adelaide was the city’s tallest structure from its 1925 opening until 1934. It was originally the headquarters of T&G Mutual Life Assurance Society, which eventually became part of French financial and insurance giant AXA. Today, the building is listed on the state’s heritage register. “We have had the opportunity to showcase our new product to our top corporate clients and the feedback has been amazing,” Quest on King William’s franchisee told HM. “Our clients have commented that the new works have made them feel as though they are in a new hotel. The new lighting and colour scheme in the rooms has made the already large rooms feel even bigger. It certainly brings the classic building into the modern era.